For a few months everything was possible in Czechoslovakia. Then Soviet tanks put an end to democratization. 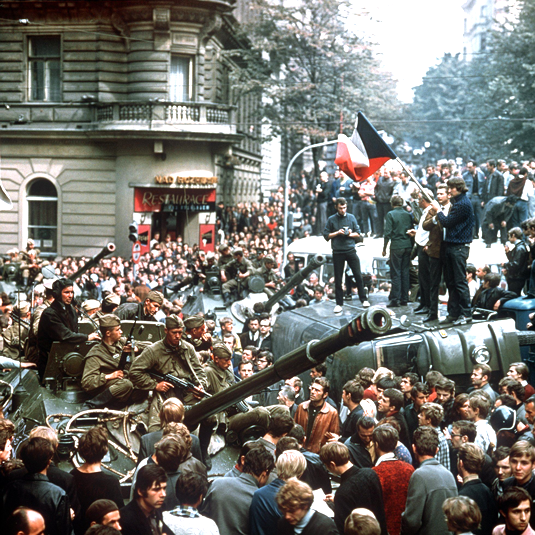 Here, LMU historian Martin Schulze Wessel outlines how events unfolded in Prague in 1968. Why did the brief phase of liberalization in the Eastern Bloc in 1968 take place in Czechoslovakia? Schulze Wessel: Czechoslovakia played an exceptional role in the Eastern Bloc. Following the death of Stalin, the Communist regime in the country had remained relatively stable: In 1956 there were uprisings in Hungary and in Poland, but there was none in Czechoslovakia, and only there had the Communist Party actually won elections after1945. So the Party’s dominance rested on a comparatively broad base of support, in particular among the workers. The Prague Spring in 1968 was, in a sense, a rebellion that was overdue, a belated attempt to reform socialism. The Prague Spring essentially began with a student demonstration in October 1967. The participants chanted: ‘More light, more heat!’ These were in fact eminently practical demands. The university system had been significantly expanded, but the infrastructure hadn’t kept pace with student numbers. There simply wasn’t enough living space available for students. Student hostels were poorly furnished, but if you were not among the ‘lucky’ ones who had a place, you had to commute long distances. But of course the students’ demands were not motivated by burnt-out light bulbs and defective radiators alone. Their metaphorical sense was clearly intended. The demonstration was a call for greater freedom in Czechoslovakia. Forces within the Party leadership, who were already dissatisfied with the political course of the regime led by Antonin Nowotný, were receptive to these calls. And an unlikely alliance of the disgruntled came into being within the Communist Party – the other element being less interested in democratization than in a federalization of the State and more autonomy for Slovakia. What were social conditions like when the movement got underway? How strong was the pressure to conform at that time? After the deaths of Stalin and Klement Gottwald, the Czech President, the State apparatus was no longer totalitarian, but it was still authoritarian in character and still bent on enforcing uniformity on society. Moreover, the pressure to conform now focused largely on outward appearances. Young men could be arrested on the street if they stuck out from the crowd and looked in any way unconventional – hair too long or clothing too casual, for instance. There were in fact repeated instances in which the forces of law and order forced young people to have their hair cut. In addition, Stalinism in the 1950s had imposed a heavy burden on Czechoslovakian society. Indeed. Political repression in Czechoslovakia was particularly pronounced, and it was directed against specific groups: Social Democrats, Catholics, Germans who were still in the country. But its primary targets were top Communist officials, who became the victims of a veritable witch hunt. The show trials against leading Party comrades such as Rudolf Slánský or Otto Šling had a particular impact, and they made a long-lasting impression, whose effects have not been adequately taken into account by historians. Most of the Communists who were arraigned were Jewish, and the court proceedings – which were broadcast nationwide – had unmistakably anti-Semitic undertones. In effect, the Communist regime used the show trials to propose a new social consensus based on a new form of anti-Semitism. This proposal was mainly addressed to those sections of the population that had supported the authoritarian Second Republic of Czechoslovakia, and had been influenced by the anti-Semitism brought by the German occupation. Paradoxically, the Communist regime was now trying to win the support of precisely these anti-Semitic circles. And this combination of socialism and chauvinism remained influential long after the show trial brought against Slánský. What impact did the Prague Spring itself have? The significance of the Prague Spring lies not only in its attempt to find a workable synthesis between socialism and democracy. Its efforts to free socialism from the chauvinism with which it had become infused during the 1950s are also noteworthy. The reformists wanted to provide a new moral foundation for society, and lead it in the direction of democracy and a market economy. It was impossible to design a new model for the future without confronting and acknowledging the crimes and mistakes of the past. In the interlocking nature of these two challenges, it is possible to discern – despite the obvious differences in the scales of criminality involved – a certain analogy between West Germany and Czechoslovakia in 1968. How did the movement originate, in response to a power vacuum or under a leadership that knew in what direction it wanted to go? We associate the Prague Spring above all with the name of Alexander Dubček, who had been a compromise candidate in the election for the post of General Secretary in January 1968. He was acceptable to the conservatives because they did not expect him to pursue a resolutely reformist policy. The convinced reformers included people like Josef Smrkovský and Josef Pavel, who had themselves been caught up in Stalinist trials. They were personally acquainted with what the regime was capable of doing – they had both been tortured. They were the real driving force behind the Prague Spring. And Smrkovský, together with Ota Šik and Pavel Kohout among others, played a very public role in the whole process. What social groups supported it? It soon became difficult to speak of specific groups in any sense. In March 1968, the drive for democratization developed into a fever and infected the whole of society. Censorship was abolished, and restrictions on public assembly were repealed. Some sections of the working class had reservations about the reforms. In particular, they were skeptical with regard to their own role in a future industrial society. Nevertheless, the majority of workers supported the goals of the Prague Spring. And in fact almost everything changed within a matter of weeks. For the first time, the media were in a position to pursue investigative journalism, and newspaper circulation doubled within a very short time. Opinion polls that gauged the popularity of the reformist politicians who were now in power attracted enormous attention. The status of politics and modes of access to politicians changed fundamentally; the formal barriers between politics and the public were broken down. All that turned Alexander Dubček, whose rather diffident public personality made him appear particularly approachable, into a political popstar in the space of a few weeks. Did the process of democratization that Dubček helped to catalyze not end up by crushing him? Dubček had grown up in the Soviet Union. He only had a very vague idea of what democracy, the separation of powers and freedom of the press actually amounted to. He was in position to proclaim democratization as a general line to be followed, without having any clearly defined ideas of what the implied goal – democracy – entailed. In addition, his loyalties were divided. On the one hand, he was loyal to the ideal of a democratically legitimated reform of socialism; on the other, he was deeply committed to the Soviet Union. So when the Soviet side began to insist ever more strongly on the preservation of certain ‘socialist achievements’, Dubček not only found himself in political difficulties but also in a personal dilemma. Who were the hawks who ultimately brought the Prague Spring to an end? And what role did the Soviet leader Leonid Breschnew play in its downfall? In terms of foreign policy, Brezhnev was not – at least not initially – one of the hawks. He had made Dubček‘s election possible and he was surprised when developments got out of hand from his point of view. The leaders of the GDR, Poland and – rather remarkably – the Ukrainian Soviet Republic were the ones who forced the Soviet leadership to call a halt to the Prague Spring. Not without cause, they feared that the process of democratization in Czechoslovakia could spread to their own countries. The invasion by troops of the Warsaw Pact on the night of the 20th of August 1968 took the protagonists of the Prague Spring by surprise. When the news of the airborne operations came in, the Politburo in Prague was in the middle of a discussion on how best to react to the increasing political pressure from Moscow. The invasion essentially knocked out the leadership in Prague and some of them were flown to Moscow, where they were subjected to considerable pressure to sign an undertaking that they would bring Czechoslovakia back onto its former Soviet course. However, the Soviet Union did not succeed in installing an alternative government in Prague. They were simply unable to find any Czechoslovakian politician who was willing, let alone able, to take on the job. Even more remarkably, the Czechoslovak population was united in its passive opposition to the invasion. Indeed, support for the Prague Spring reached its peak after August 21st 1968. It took until April 1969 for the new, and exceptionally authoritarian, regime to achieve its goal of so-called “normalization”. How did the reformist politicians react? Did they in the end accept the Soviet demands? The Czechoslovak government signed an agreement, which included a secret protocol that outlined the steps to be taken to ‘normalize’ the situation, and was withheld from the public. At first, people welcomed the agreement because they believed that it safeguarded the most significant achievements of the Prague Spring, such as freedom of expression and freedom of assembly. They only gradually realized the extent of the commitments that the Communist leadership had been forced to enter into vis-a-vis Brezhnev. Dubček found himself in an insoluble dilemma. He baulked at signing the agreement, but he was finally pressured into putting his signature to the protocol. Refusal to sign would have had incalculable consequences not only for him personally but also for his country, but in signing it he became a tragic figure. Students continued to demonstrate in his name on the streets, but it was he who bore the political responsibility for the new wave of repression. This contradiction was highlighted by the self-immolation of the student Jan Palach in Prague in January 1969. Palach wanted his own death to catalyze resistance against the withdrawal of the freedoms that had been won in 1968. Dubček, who was still the nominal leader of the Communist Party, suffered a nervous breakdown. To what extent was the Prague Spring inspired by ‘the spirit of 1968’? 1968 had a broad range of facets, but there were some obvious global trends. Students played a significant role, social scientists determined the terms of discussion, and youthful protest, expressed in a preference for certain sorts of music and dress, was a prominent feature virtually everywhere. All that can be found in Czechoslovakia also. But there were some marked differences. The most important was that, in Prague, students were able to form an alliance with the generation of Communist reformers, a pact between protesters and the powerful. The fact that politicians in the top echelons of the Communist Party – which after all had been responsible for two decades of repression and mismanagement – were able to gain the confidence of protesting students by their willingness to reassess the past and, in some cases, by acknowledging their own mistakes, verges on the miraculous. That constitutes one very obvious contrast with the course of 1968 in Germany and France. Seen from a long-term perspective, was the Prague Spring just a passing episode? It was much more. For one thing, opponents of Communism immediately realized its epochal significance: For anti-Communist forces in the West the Prague Spring provided definitive proof that the Communist Utopia was at an end. Indeed, after 1968, the Communist Party of Czechoslovakia abandoned all attempts to develop a long-term political vision, and tried to win the support of the population by providing a wider range of consumer goods. But for the people of Czechoslovakia, the real legacy of the Prague Spring was that it had shown that change was possible. In this sense, 1968 was a prelude to 1989. Prof. Dr. Martin Schulze Wessel holds the Chair of Eastern and Southeastern European History at LMU. Martin Schulze Wessel’s recent book on the Prague Spring (Der Prager Frühling: Aufbruch in eine neue Welt) is published by Reclam-Verlag.